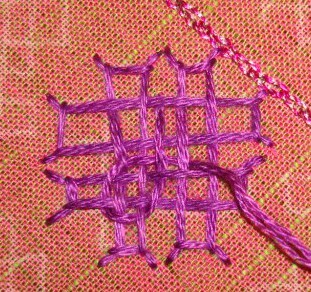 After working on the basic woven square, it is time to try another simple woven kutchwork pattern. 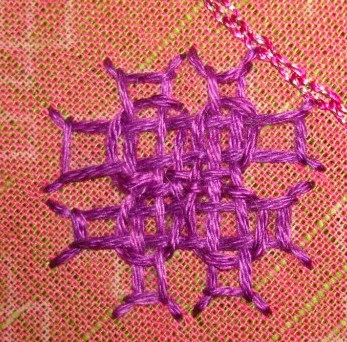 Bar-1- Start working the basic lines for working the interlace stitch, in the first bar, just take care about the corners, we don’t[can’t] go over or under any lines now. Insert the needle into the cloth. Bar-2-Then move to the adjacent bar, and work as the first bar. Insert the needle into the cloth. Go above the fourth line. Go above the first line. Insert needle into the cloth. Bar-4-Move on to the adjacent bar[the last bar] work the same as the third bar. 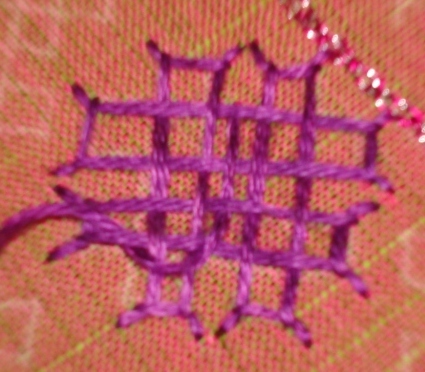 The bars need to be woven, the outline [the squares where all the threads intersect] also needs to be woven. Step-1 needs to be worked first, because it the basic line on which the interlacing has to be worked. Step-2 and Step -3 can be worked in any order. I am stating this now because, it is better to read the whole thing and then try it for yourself, which one suits you, and practice accordingly. That is why I have given them as two different steps. Working first step 2 and then step 3 will produce the same result are working first the step-3 and then step-2. Turn at right angles , when you reach the end, turn twice more at right angles. Keep moving, going below and above the threads alternatively. 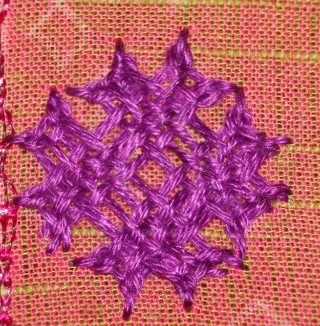 Repeat the turning and the path till you reach the starting point.insert the needle into the cloth. 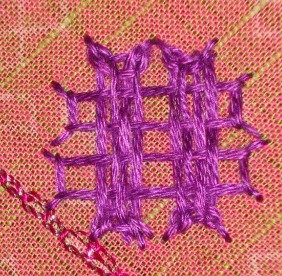 In this step the bars are worked [woven ] first. Study the thread going adjacent to your path and work , take cue from that and move above or below accordingly. Same path is worked for the side bars too. 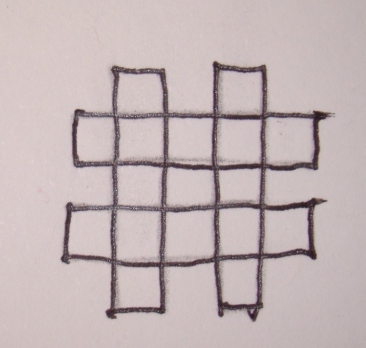 Additional movements involve going above and below the threads which are worked in the previous picture[ inside the bars]. 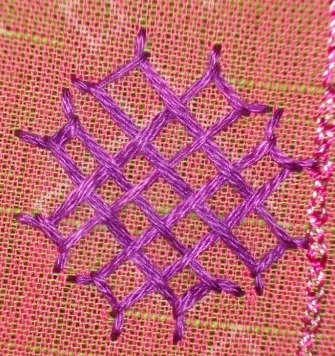 I have worked step -2 and step-3 on the same two patterns for better understanding of the working, but when they are worked on one pattern, the steps 2 and 3 should go together to form the whole kutch work embroidery. All the three steps together completes this pattern. Hi, Thanks for the tutorial got the trick of the pointed corners. 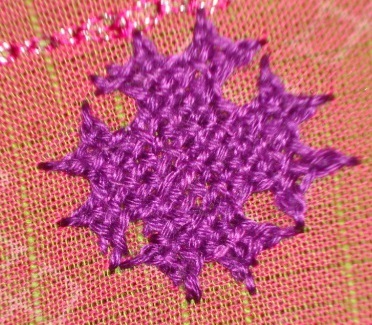 I had worked this motif for a yoke. with the pictures taken on the work in progress, this tutorial was written. I have to learn putting in numbers. let me see what I can do.